Just published and open access is a new article that demonstrates the value and potential of 3D scanning and printing for osteological identification of passenger pigeons and other extinct or rare animals. Some zooarchaeologists have been producing 3D images of animal bones for a while now. This article describes the next step, the creation of actual physical replicas (which they dub “artifictions”, as opposed to artifacts) using 3D printers. The practical goal is to increase the reliable identification of animal species (especially rare or difficult to distinguish ones) in archaeological faunal assemblages, which now is dependent on the zooarchaeologist having ready access to a large and varied collection of actual animal skeletons. Why aren’t digital representations of bones enough? For examples, the authors use the passenger pigeon and the harelip sucker, a freshwater fish that, like the passenger pigeon, went extinct near the beginning of the twentieth century. While there are still some technical (and budgetary) limitations with the 3D printing process, they argue convincingly that “this is the only non-commercial approach that will make available physical representations of skeletal elements from extinct species for quick distribution to a large number of researchers.” (p. 19) Efforts are underway to make these models available for download. Next, somebody needs to buy me a 3D printer. 2015 Using Digital 3D Scanning to Create “Artifictions” of the Passenger Pigeon and Harelip Sucker, Two Extinct Species in Eastern North America: The Future Examines the Past. Ethnobiology Letters 6(2):15-24. The Peabody Museum of Harvard University announced a test of a recently developed technique that can identify the animals to family or species from extremely small amounts of animal tissue (bone, skin, and other material containing collagen). Peptide Mass Fingerprinting correctly identified 89 percent of the samples to at least the family level. For more information, see the Peabody Museum announcement. Sorting going on of bones from the 1990 excavation at Lamoka Lake. These are white-tailed deer astragali, all from the plowzone/disturbed layer. It’s been a while since we’ve written anything about the actual archaeology of the Lamoka Lake site, but that’s about to change. 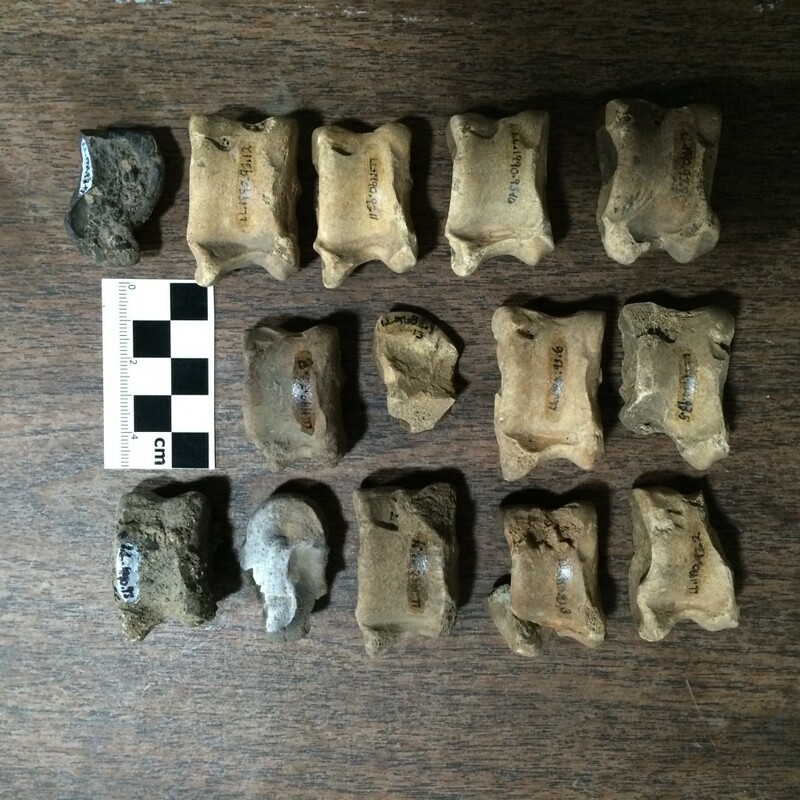 I’m starting the identification of a large assemblage of animal bones from the site that hasn’t been studied before. 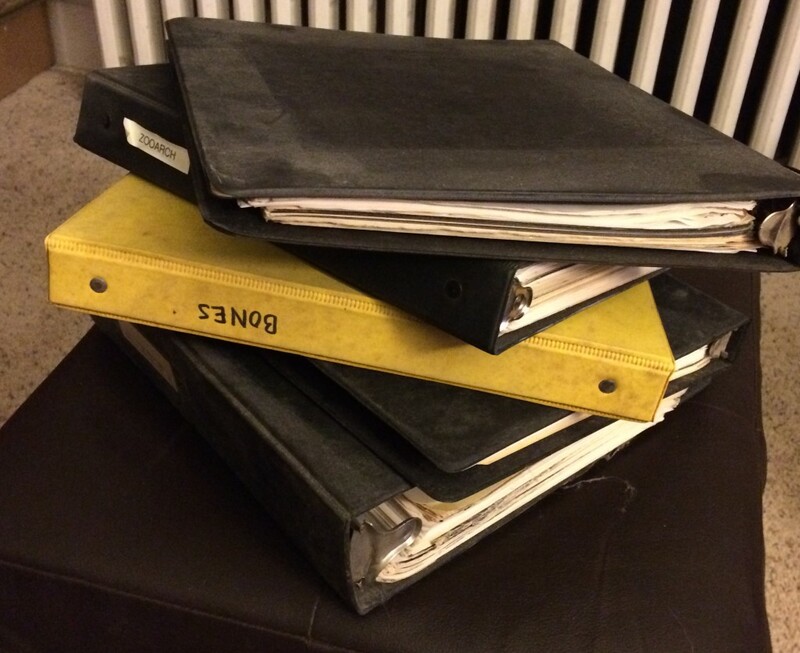 The first step is to get out the bone binders with photocopied and hand-drawn reference material. 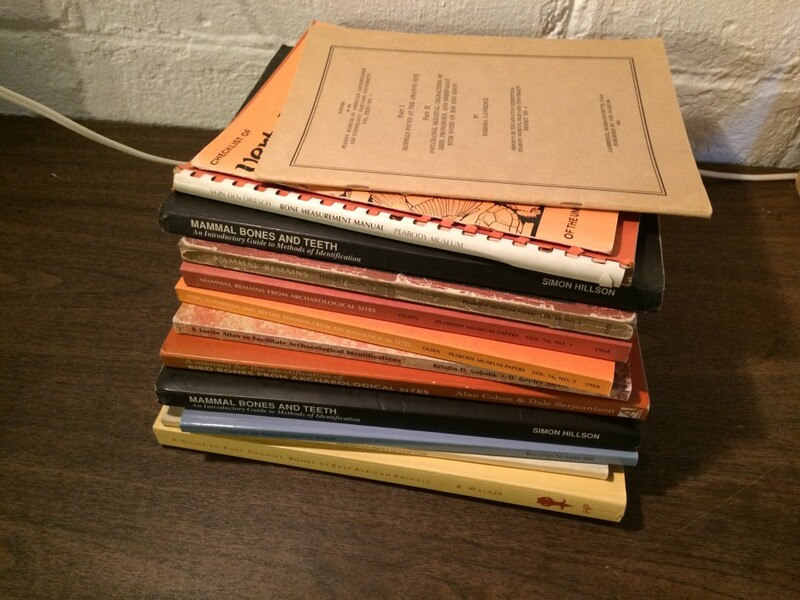 These are in need of some new binders. The bone identification guides are also getting pulled out of the bookshelves. Yes, I know there are some duplicates. Shells and body parts of endangered turtles were identified by paleontologist Don Brinkman, leading to the conviction of the smuggler. this case — which involved combing through a container with 945 turtle plastrons (bottom part of the shell), 2,454 turtle shells, and 52 bags of turtle fragments within 815 cartons, followed by a second container with 224 bags of fragments in 842 cartons — was the biggest Brinkman has ever worked on. Full Story at the Calgary Herald.